Tynemouth Longsands is the next beach to the north, an expanse of fine sand 1200 yards long, lying between the former Tynemouth outdoor swimming pool and Cullercoats to the north. Pictures and prints of Tynemouth visit our site we have probably the widest selection available on line. In the late 18th century, sea-bathing became fashionable in Tynemouth from its east-facing beaches. King Edward's Bay and Tynemouth Longsands are very popular with locals and tourists alike. Tynemouth is also a world famous surfing championship venue. Prior's Haven is a small beach within the mouth of the Tyne, sheltered between the Priory and the Spanish Battery, with the North Pier access on its north side. It was popular with Victorian bathers and is now home to Tynemouth Rowing Club and the local sailing club. In 2013, Longsands has been voted one of the best beaches in the country by users of the world’s largest travel site Trip Adviser. Trip Advisor users have voted the beach the UK’s fourth favourite beach in its 2013 Travellers’ Choice Beaches Awards, beaten only by Rhosilli Bay in Wales, Woolacombe Beach in North Devon and Porthminster Beach at St Ives Cornwall. The beach was also voted the 12th best in Europe. Signed limited edition giclee print by Joanne Wishart.Print image size 36cm x 36cm.Outs.. Signed limited edition giclee print by Joanne Wishart.Print image size 36cm x 36cm.Outside s.. Signed Limited edition Giclee printed on Breathing Colour Elegance Velvet 310gsm. Double mountedMoun..
A beautiful summer's day at Cullercoats Bay. 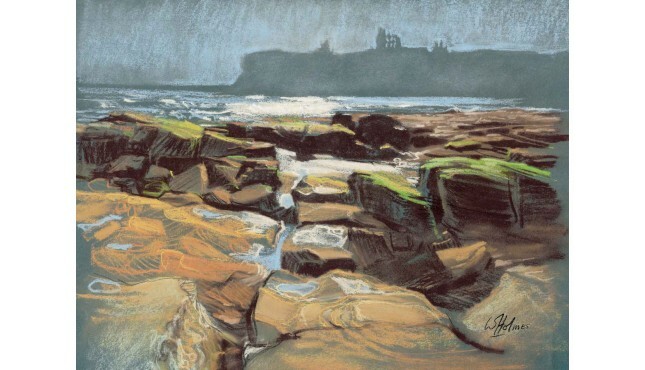 Everyone enjoying a day at the beach.Format:&nb..
As with a lot of my work although it uses Newcastle and the North-East as a backdrop the location is..
Capturing Tynemouth Priory and both North and South PiersFormat: Limited edition Giclee print on Eps..